The Quick and The Thread Winner! 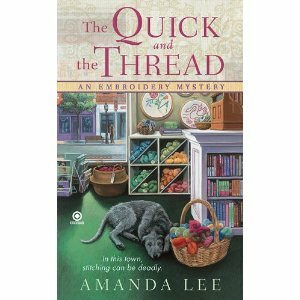 Sew, we’re all gathered back here to find out who won Amanda Lee’s embroidery mystery, The Quick and the Thread. The suspense has my stomach tangled in knots. In fact, I’m on needles and pins! But I’ll try to pull myself together. MADELINE! You’ve won! And believe me, The Quick and the Thread will keep you in stitches. You have to get up pretty early in the morning to beat my pun-making skills. Or at least before I blog.Congrats, Madeline! Happy reading! Yay Me! I'm off to check it out!